Piff the Magic Dragon Show Las Vegas is an entertaining comedy and magic show that combines a talking dinosaur as well as a Chihuahua into the act. This 60-minute event features Piff the Magic Dragon and Mr. Piffles which make the perfect combination of laughs and mysterious magic on stage for guests to enjoy. The show will entertain teens and adults as the two performers interact effortlessly on stage with each other as well as audience members. Piff the Magic Dragon Show and Mr. Piffles incorporate many different segments from their greatest hits of performances into the show. Each routine might be something from the past but with new innovative ideas injected into the comedy and magic show. Audience members might find Piff’s wit a little off center until people realize the humor itself is British in content which includes stupid things we have done as people and the humor is almost bizarre at times. Think of when you watched a Monty Python movie which incorporated slapstick with genuine comical insanity. His quick wit is stellar and moves the show along nicely while engaging with the audience many times throughout the show. 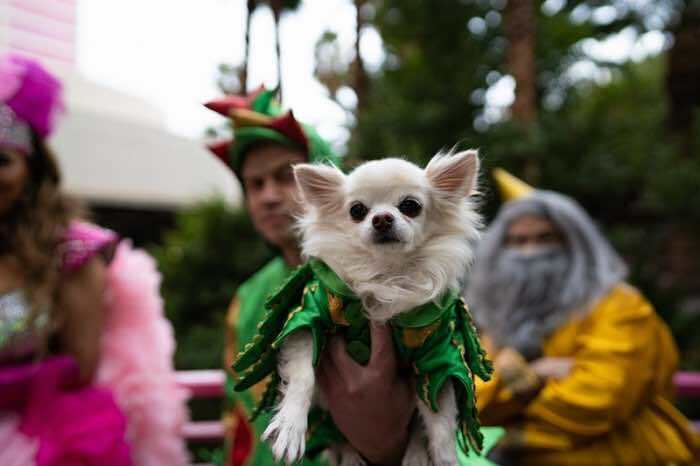 Mr. Piffles is perfect in his role as the world’s only Chihuahua that performs magic. Guests will be amazed when Piff the Magic Dragon places Mr. Piffles inside a cannon and then shoots him across the stage. Mr. Piffles can remove a straightjacket faster than any dog and most magicians in the world. Mr. Piffles is a true professional when he discovers a missing playing card within a can of dog food. Bugsy’s Cabaret located within the Flamingo Hotel and Casino is the perfect venue for Piff the Magic Dragon Show Las Vegas and Mr. Piffles. The venue is small and personal making volunteers from the audience easy to spot. The multimedia effects with synchronized lighting are perfect. Stage props easily appear and disappear on the stage with the show moving seamlessly from each magical segment to hilarious segment. 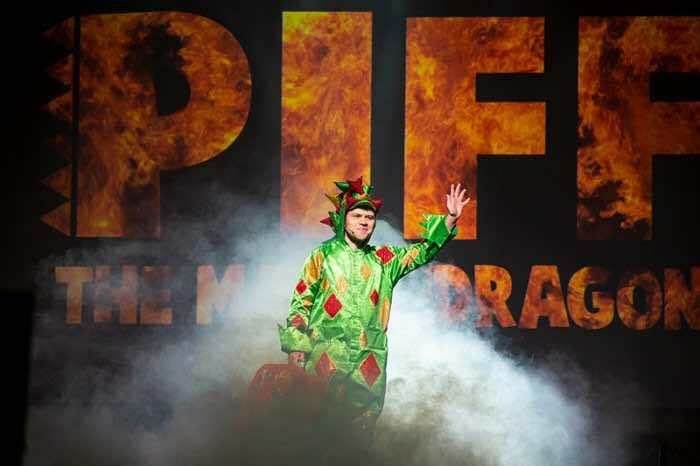 Piff the Magic Dragon Show and Mr. Piffles is a great way to spend your time when you are looking for an entertaining event that combines the perfect amount of humor and magic. After all, where else can you watch a grown man in a dinosaur costume with a magician that is a dog? The stars of the Piff the Magic Dragon Show and Mr. Piffles are an amazing duo. Piff the Magic Dragon is actually John van der Put who was raised in South East London. When he was a teenager John became interested in magic and at eighteen years old he became one of the youngest people ever to lecture at The Magic Circle. He would later attend school in order to study computer science but a life altering event took place when he was diagnosed with acute pancreatitis. John dropped out of the computer science field and began taking drama classes at the Central School of Speech and Drama. John would soon find himself co-founding a cabaret company called Standnotamazed. In 2008, John incorporated Mr. Piffles into his show after he attended a party dressed as a dragon where he was encouraged by friends to bring the dragon costume to the stage. After receiving many accolades for his performances on America’s Got Talent, he was signed to perform in Las Vegas. The show is performing at Bugsy’s Cabaret located within the Flamingo Hotel and Casino. The venue is very small and each seat has good sight views. The show is open to patrons thirteen years of age or older. The show is playing Monday through Wednesday at 8:00 P.M. Piff the Magic Dragon Tickets are on sale now and range from general admission seating to the Circle of Trust VIP seats.